The Antelope Canyon in the USA, Arizona. English : The Antelope Canyon in the USA, Arizona. The Franco-Prussian War: Defence of Paris-Students Going to Man the Barricades, by Illustrated London News. English : The Franco-Prussian War: Defence of Paris-Students Going to Man the Barricades, by Illustrated London News. A Monarch Butterfly (Danaus plexippus) on a Purple Coneflower (Echinacea purpurea). English : A Monarch Butterfly (Danaus plexippus) on a Purple Coneflower (Echinacea purpurea). 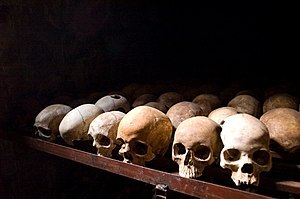 English : Nyamata Memorial Site, Rwanda. The quadriga on top of the Brandenburg Gate in Berlin (Germany) at night. English : The quadriga on top of the Brandenburg Gate in Berlin (Germany) at night. Black-backed Jackal (Canis mesomelas) near Wolfsnes, Western Etosha, Namibia. English : Black-backed Jackal (Canis mesomelas) near Wolfsnes, Western Etosha, Namibia. View from the Mittlist Gfäll Alp to Schrattenflue and Chemmeribodenflue, Entlebuch region, Switzerland. English : View from the Mittlist Gfäll Alp to Schrattenflue and Chemmeribodenflue, Entlebuch region, Switzerland. A strolling reindeer (Rangifer tarandus) in Lappland, Sweden. English : A strolling reindeer (Rangifer tarandus) in Lappland, Sweden. Elysette Namur, Belgium, by night. English : Elysette Namur, Belgium, by night. Bassist Paul Simonon during the rock music festival Eurockéennes de Belfort. English : Bassist Paul Simonon during the rock music festival Eurockéennes de Belfort. The south side of Volcano Popocatepetl, Mexico. English : The south side of Volcano Popocatepetl, Mexico. Dunes in Namib Desert, Namibia. English : Dunes in Namib Desert, Namibia. 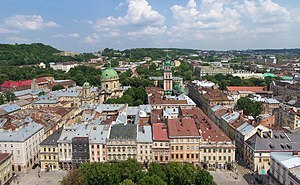 English : Downtown Lviv, Ukraine. Royal seal of King Władysław II Jagiełło of Poland. English : Royal seal of King Władysław II Jagiełło of Poland. Abandoned Rassàss/Pforzheim lodge in the Valle Slingia, Italy. English : Abandoned Rassàss/Pforzheim lodge in the Valle Slingia, Italy. Aerial view of The Grand Prismatic Spring of Yellowstone National Park. 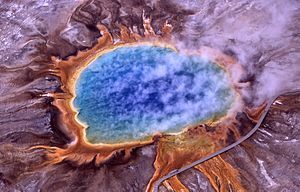 English : Aerial view of The Grand Prismatic Spring of Yellowstone National Park. English : Luiz Inácio Lula da Silva, President of the Federative Republic of Brazil. Panorama of the island Nunâ in Greenland. English : Panorama of the island Nunâ in Greenland. A better close up view of the Rosette Nebula. The red color comes from Hydrogen. English : A better close up view of the Rosette Nebula. The red color comes from Hydrogen. A Paradise fish (Macropodus opercularis). English : A Paradise fish (Macropodus opercularis).